On glide for Prospect Peak. Started out pretty uneventful with a bunch of us deciding to get going on the the task early (since it was a practice day and wasn't going to count anyways. Out by Grant's Pass we (Marty, Bill B, James, Eric, et al) were crossing the valley west to Prospect Peak. On about 2/3 bar when I had a big frontal which horseshoed and fell back behind me. The tips clapped together (which is a bad thing on the IP6) and the left one threaded its way down the lines for about a 40% cravatte. The right tip came out OK, but I had a couple of riser twists and the glider was winding up to the left with only abut 1200' above the ground. I'm happy to report that despite never tossing before, I can still recognize a tossing situation and do the deed ;) My reserve came out no problem and I felt the reassuring tug on my shoulder straps indicating the velcro had unzipped and I was hanging down properly. The problem started after that. 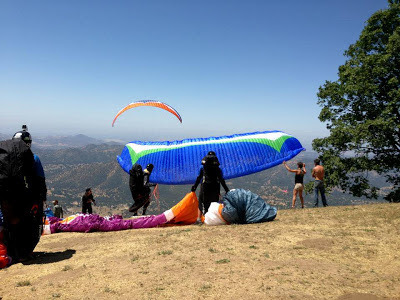 The glider started downplaning and twisting up even more so I now had something like 6-7 twists between me and good lines, and I couldn't reach past the 6-7 twists with my short arms. So I had to hand-over-hand climb up and past the twists until I could reach the good lines and get my glider under control and into something stable that wasn't interfering with the reserve. Where I ended up. Haven't moved my gear yet. Finally got the glider under control and saw I was coming up to the ground so I decided to hold the configuration I had (it was staying stable) and ride it to the end. I was coming up to a property with a big barn and it looked like I was going to land on the roof. It was a big slanted roof with a 20' drop off the edge and I didn't want to land on the roof, slide down it, and fall the last 20', so I put my hand out to push away and landed on the ground next to it. It was a pretty nice landing all things considered. I came down a bit hard on my heel and my wrist, spraining (I think) the wrist and bruising the heel. 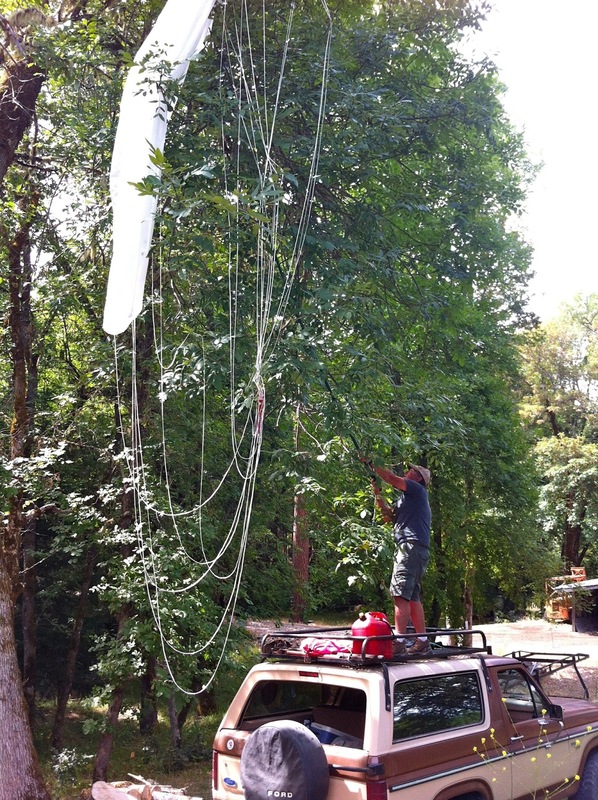 My glider landed next to me, not a scratch on it, while my reserve got caught up in the tree about 20' overhead. 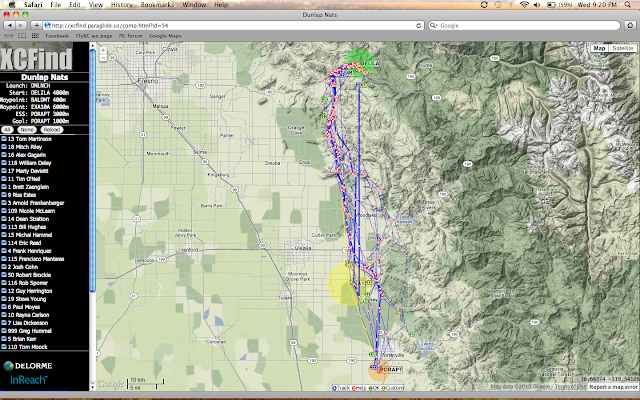 The reserve ride took maybe 20 seconds, with 15 of those working on getting my glider under control and stabilized. After ascertaining that I was unhurt for the most part I radioed that I was OK to the circling pilots and phoned HQ to report my position along with my SPOT message (I chose to use the OK message and not the help message as I was pretty much OK and already in cellphone contact). I was really glad to not hit the barn! The lady at the house was very nice and helped me pack up just in time for Hawaii Pete to show up and cut the offending branch down with his polesaw. Looks like a 12" rip in one panel but that's it, fixable I think and in any case it looks like I've got a couple of rain days to get a temporary replacement sorted out. I have a spare reserve and deployment bag at home, but I neglected to bring them, d'oh! Pete cutting the tree down. It's been a long competition but it's finally over after 7 epic tasks. Sunny and lightish winds so the task committee created a 60km closed circuit course to take us back to the Pizza goalfield in time for awards etc. 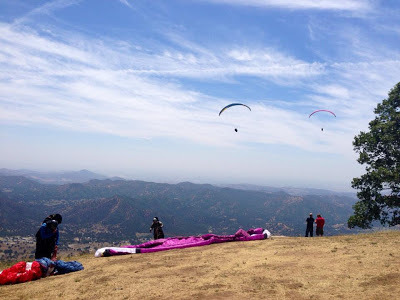 The flying was pretty uneventful until Bear Mountain, where a few of us were trying to climb out over the antennas for the jump to Doyles when we saw a glider sitting open in a field in the middle of nowhere. Repeated radio calls to the pilot got no response and there was no movement of him or his gear for coming on 20 minutes. After circling over him and still seeing no movement, I decided it was weird enough to warrant a personal check so spiralled down (through lift) to land next to him. A spread-out and not-moved glider is the universal sign for "I'm in trouble" or "I'm hurt" or "I'm dead" so I was preparing for the worst, making a mental checklist of what I had onboard for emergency supplies and hoping I would have cell service when I landed in case I needed to call 9-11, and thinking of having to use my SPOT to call it in otherwise. But as I came in on final approach the idiot got up from his harness and started bundling his glider. 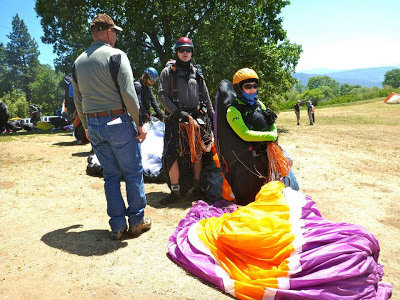 Turns out it was a free-flying tandem pilot and his girlfriend, and he was completely surprised to hear that leaving a glider out in the middle of nowhere without moving it, and not being on the radio to communicate with others, is not cool. I was so annoyed with him that I gave him a piece of my mind about pilot and glider etiquette when landing out and that everyone flying above him thought he was in trouble and HQ was getting involved. I'm not sure what they taught him in flight school, but bundling your gear when you land out on XC is the first thing you do so that everyone else knows you're OK. I don't really know (or care) what they were doing for all that time, but they walked off, leaving me to pack up and hike out from the middle of nowhere by myself. After radioing the other pilots and HQ that they were fine, I had a nice 1 1/2 hour hike in the 30 degree heat until I reached a very nice farmer who gave me a ride to the goal field, just in time to watch the lead gaggle coming in on final glide. As for myself, the organization decided to give me a "normalized" score based on my previous days' scores to compensate me. That was quite nice and appreciated, but I am still highly irritated that the tandem pilot would show so little consideration when landing out and not having safety as his priority. For a while, a lot of us were wondering what was going on with that nonmoving glider and slowing down to take a look, using up some mental horsepower that we didn't really have to spare after 7 full-on days of flying and racing. I'm glad the tandem folks are OK but the pilot in command was very unprofessional in my opinion. A monster task was called today to take advantage of the supposed NW winds; also possibly because we could have easily flown to Bakersfield yesterday ;) The actual goal was just north of Bakersfield, about 135km away, to avoid the airspace around Bakersfield proper. I had a great start but got very low in Drum Valley with Alex and Josh. Josh got away and with the lead gaggle pulled away, while I was forced to scunge my way along in tiger country, looking at landing many times with a very long hike out, until I could see a highway pass in the distance and knew I was saved as far as a long walk was concerned. Alex was high at this point but got low as I got high, but was able to get high again to turn around and fly back towards Dunlap. The reason he did this is because it was actually SW winds, not NW, and the whole south leg was into wind and thus very slow going. If the entire courseline was going to be SW wind it was gonna be a very long and slow day! I finally got grounded just past Woodlake as the crossing there was too much for me alone in the SW headwind, maybe 50km away. It was definitely dead air there as pretty much no thermals came through the entire time I was waiting there, and in fact Alex Gagarin landed in the exact same field about 1 hour later, complaining of the same thing. According to the SPOTs we could see the lead gaggle of about 8 pilots was still heading south but shedding pilots every so often. In the end only 4 pilots made goal, with a few more landing just short. 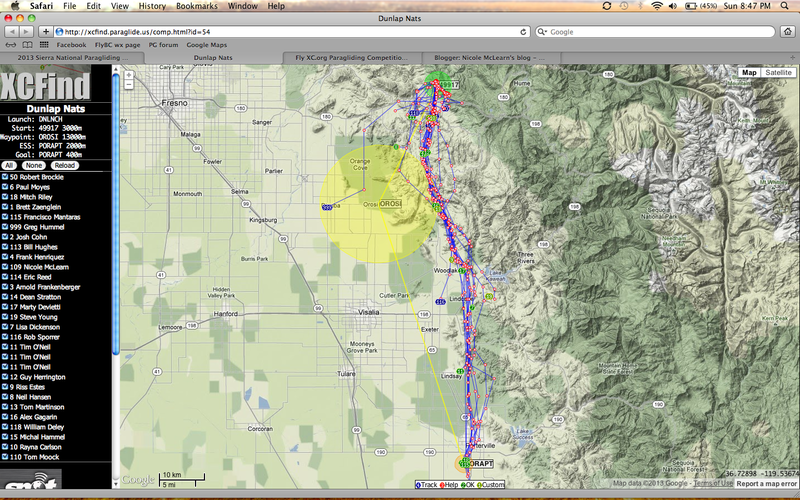 It looks like most of the lead gaggle took the flats route, reporting a lack of strong thermals and dust devils unlike yesterday, and a SW cross-headwind until at least Porterville where it finally turned more NW. I think a lot of pilots didn't make it out of Sand Creek so I'm hoping I stayed in the top 10 for today. Tomorrow is the last day and we are definitely ready for a rest day afterwards, as we've been flying 7 out of 7 tasks. This place is definitely consistent for reliable sunny flyable weather, so long as the winds stay within reason. The first day of the US Nats and it was high pressure and stable-feeling, but I've been told the thermals are nicer out near to the Central Valley, so I was glad when the task was to take us out that way. It was a shortish task, about 58km, but it involved crossing a bunch of low hills out to the main valley, and then upwind to another TP before downwind into goal in Squaw Valley. I'm actually rather glad there are only ~30 pilots in the comp, since it made the start gaggle very nice and manageable, which is a good thing since the air was extremely snarly over launch and Delilah. Lots of glider management going on and I saw several whacks, so I was glad to have lots of clearance in case I needed the space. Even so, I was very glad to see the start time finally tick down and we were allowed to start. Some pilots chose a more circuitous route via Bald but most of us took the direct line over Granny's and it was slow going! 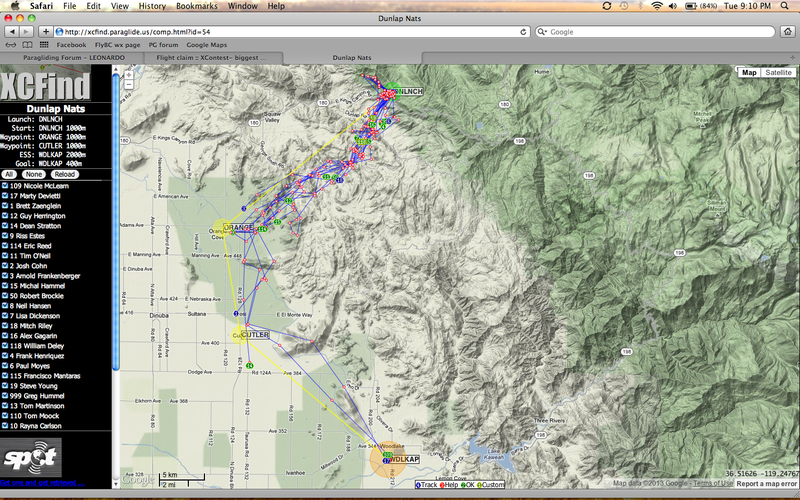 Lots of slow climbs and wind, and I was forced to take some climbs downwind and stop in EVERYTHING. But even though I took a different line I ended up meeting up with the lead gaggle out at the final foothills and we then tanked up for the push out into the flats to tag Orosi. I saw many pilots low and landing out on the flats, and I was almost one of them as I finally got a climb over the gravel pit and then I was back in the game. I estimated it pretty well and arrived over goal with maybe 200m to spare. I was super-stoked since the entire flight was basically a series of low saves and low climbs; it was probably the most technical flying I've done in a very long time. But because it was so hard, it was very satisfying to make goal when so many others didn't (only 6-7 pilots made goal). nd lots of active flying; tomorrow may be windier so we'll see what kind of task the committee sets up! Packing up at goal! Photo courtesy of Brett Zaenglein. Me in the air over Dunlap launch. Photo courtesy of Guy Herrington. I had just changed the lines on my IP6 so I wasn't sure if the funkiness was the new lines, the air, or me. Turns out it was the air as many other pilots reported snarly conditions and multiple wind directions depending on how high you were and what mountain you were over. The flying here looks to be quite technical with many different routes, multiple valley systems (all with their own micrometeorology), and low-ish hills with potential long glides out. I'm really looking forward to trying my hand at this type of flying in a comp situation with lots of other like-minded pilots! A bunch of us landed in Squaw Valley in thermic conditions, and we had one pilot with a suspected broken wrist after sticking his hand out upon landing. We've got about 30 pilots here so far for the Nats so it looks to be a nice intimate comp (for a change!). Not sure where the comp results will be, but the Nationals website is here. The skies started popping with cu's just after 11am so we knew it would be a good day. But the winds were SE which is not the greatest direction....you have to detour a bit to avoid Edmonton airspace which costs time. But we made the most of it; I got 149.5 km after getting shot down by a blue hole and a lot of wind; Alex landed a couple km's past me. It sounds like Alex and I had quite different flights since we were about 1 hour apart in getting into the air. When I launched I had some virga to immediately fly through (with the associated sink behind it) so I had to scratch for a long time, and that pretty much set the pattern for the day. 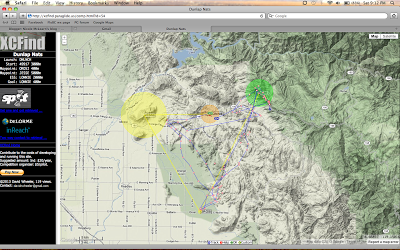 I found the day to be quite slow and not easy and I never got to cloudbase; my highest was 2700m. Alex on the other hand said he had plenty of lift and got cloudsucked at one point with hail. In the end we landed about 2km apart from each other despite being 1 hour apart and Brett (the scheduled driver for the day) was right there to pick us up and provide an escape from the incredible mosquito swarms...I figure there must have been a mass-hatching or something just before I landed as I've never seen it that thick! I think my flight can count as a new Canadian female OD record since the previous record is 135.5 km; we'll just have to make sure the tracklog is accurate and all the paperwork is in order. Well it's been a definite change from the usual mountain flying I do in BC...here it's flat and you can see the weather coming for km's with nothing in the way! After a beautiful drive through the Icefield Parkway we arrived in Camrose to meet Brett Yeates and his tow winch system. After a day of learning how to operate the tow system it's been switchy weather, with a lot of wind and big skies. 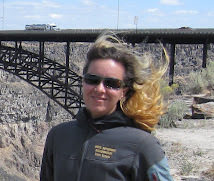 As a primarily mountain pilot, I've been trained to equate lots of wind=bad. But out here, lots of wind is normal and required if you want to fly far. So we are slowly getting used to the idea of towing up in strong (30kph) winds and landing in potentially stronger (40kph) winds, because up high, it doesn't really matter! Yesterday after a switchy start to the day, with us moving from a N-S road to a E-W road (it was NW), Brett and I were able to get away with Alex being the designated tow/retrieve driver. Lots of shade around and the climbs were weirdly slow, so it was mostly a survival day of staying high and waiting for the shade to move off before continuing onwards. Plus I had to detour around the Wainright CFB airspace which cost me some time. Even so, I was able to get 91 km (84 straight line) in just over 2 hours, on a day considered to be below average (3-4) on a scale of 1-10. On a real cracking day it will definitely be Canadian record-able! After yesterday's overdevelopment, today was actually a bit stable in the Fraser Valley. The cu's were small and set quite far back, so we knew it was time-sensitive to get away before it baked out too much and escape to the big mountains where it was more unstable. The 5-6km of unlandable terrain just past Blinch. Kenyon was actually the crux for me, as I was so paranoid about staying below 1981m that I actually got too low on the crossing, and arrived so low I didn't really have a proper LZ as a bailout. I could have landed in the snow next to the still-frozen Kenyon Lake, but then it would have been a multi-hour posthole through the snow to a road and possibly a night out, and I wasn't really into that. So I made up my mind to climb out of there, and managed to get back up to peak height and some breathing room while I still had some semblance of a road below me. Banjo and the Chehalis River. Woodside in the distance. The next section (what most people would term the actual crux) is about 5-6km of unlandable terrain...no road, no cutblocks, and no retrieve. It is soooo tempting to get really high to cross this stretch easily, but nope, 1981m is all you're allowed once coming back from Blinch. So you have to climb high but stay legal, and keep surfing along until you reach the Chehalis drainage and a retrievable road becomes within glide again. This is not something you want to do low, or on a too-unstable day (since if you get shaded out by OD, you're in trouble)! Once arriving over the Statlu area it becomes easier as the valley actually flows downhill from here so you can, if necessary, just keep gliding and you'll make a cutblock. But if you want to fly back to the Fraser Valley, you have to keep going and aim for Banjo! No LZ's this side of Woodside...heading back to Chehalis LZ. Alex and Al were at the bump just SE of Banjo but not climbing out, and reported they were going to land at Harrison Hot Springs. I decided to see how close I could get to Woodside and then land at the Chehalis native reservation soccer fields; for the XCanada contest, you have to get to within 5% of your start to get the triangle bonus and Harrison Hot Springs isn't close enough ;) It was actually quite easy to glide to the north side of Woodside, and had I been higher I may have been able to surf the north side back to launch and properly close my triangle. But I turned around 4km from launch so I could make a safe landing, and the very friendly folks at the soccer field offered me a ride to the car right away! Chehalis LZ with Woodside in the background. It was a very special flight, but it's not something to do every day...you need light winds, the right amount of stability (the almost-becoming-too-stable-days at Woodside seem to be best), and most of all, it's best to do in a group for safety. 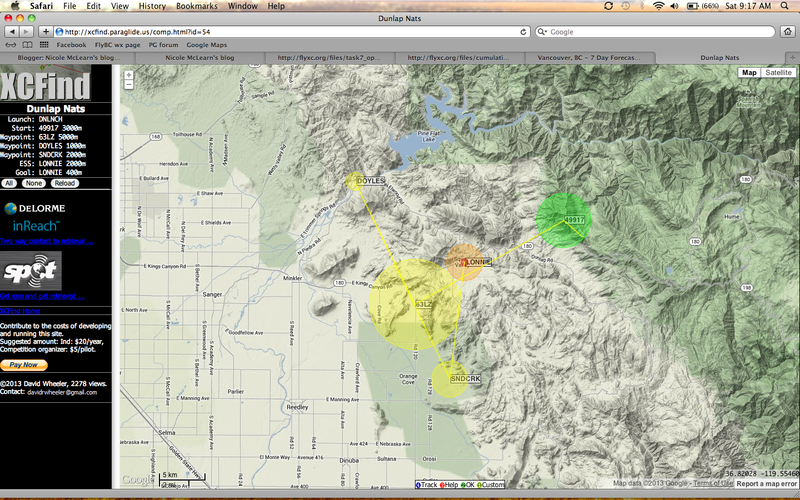 Landing out in the Blinch/Statlu areas would be full-on and it's best if you fly with a SPOT. And keep an eye on the sky...it would be really unfortunate to reach the unlandable section just as the sky milked over (for example) or a big cu blew up and blocked your way back to civilization. And watch your altitude if you want to stay legal and post your tracklogs...it's easy to get too high!